Studio 22 is by far the best dance studio in Dallas. Sergey & Michelle came highly recommended by Karina Smirnoff. Not only are they world-class dancers and instructors but they are world-class people. I highly recommend them and Studio 22 if you're looking for a place to learn to dance. 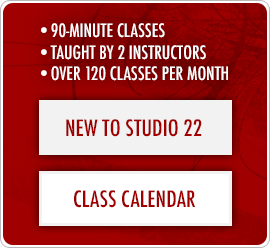 If you're looking for the best ballroom dance teachers in Dallas, you must go to Studio 22! Fantastic studio, quality instructors, and a warm community of dancers. When I was in Dallas for Dancing with the Stars I really enjoyed training Michael [Irvin] out of Studio 22. From the moment I stepped into Studio 22 I loved it! The warm and welcoming atmosphere made me feel chill and relaxed. The students were eager to learn and all the instructors were so talented, I couldn't have asked for more. Watch owners of Studio 22, Sergey and Michelle, perform on Dancing With The Stars with Cheryl Burke to Tito Puente's Oye Como Va.
Sergey and Michelle teach Amy & Chris from WFAA's Good Morning Texas how to Salsa. SIgn up to receive Studio 22 updates!